Tonal anomalies in Vernal Crater, Arabia Terra (top image, red arrows) are seen as spring-like mounds similar to those spotted in Dalhousie, Australia (bottom image). 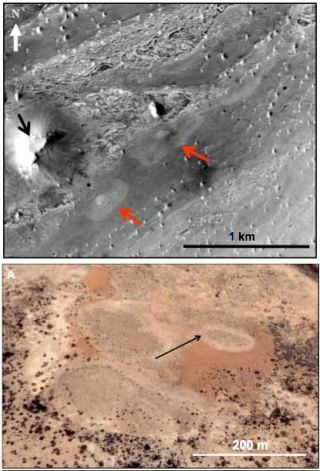 There's a growing buzz in the astrobiology community that ancient hydrothermal springs may have been spotted on Mars. Thanks to the eagle-eyed work of Carlton Allen and Dorothy Oehler of NASA's Johnson Space Center, "spring-like" mounds have been found in Vernal Crater in Arabia Terra on the red planet. The high-powered zoom lens of NASA's Mars Reconnaissance Orbiter (MRO) has picked up the features - two possible ancient hydrothermal springs are viewed as light-toned, elliptical structures. The martian features have a striking similarity to spring mounds here on Earth, such as those in Dalhousie, Australia. The potential big news here is that, if true, hydrothermal spring deposits on Mars might preserve evidence of martian life. These features would not only have supplied energy-rich waters in which martian life may have evolved, but also would have provided warm, liquid water to martian life forms as the climate on the red planet became colder and drier. At present, whether life has existed on Mars in the past or may still dwell there today, remains an open question. Allen said more work is needed to better analyze these features and also look for other similar spots on Mars. In particular, use of MRO's Compact Reconnaissance Imaging Spectrometer for Mars (CRISM) can sort out the composition of the features in Vernal Crater. However, due to the dusty nature of Arabia Terra, that has crimped mineralogical assessment of the mounds. Meanwhile, the prospect of identifying ancient thermal springs on Mars would be a boost for astrobiologists, Allen and Oehler report. These could be sites where martian life evolved, sought refuge as the climate on Mars became colder and drier…and where evidence of that life may be preserved.